Singapore is not only famous for its Singapore Sling, but also for its Singapore slang, better known as Singlish. During your visit of Singapore it is important to have a few notions of Singlish which will help you to make the most of your trip and discover the rich cultural influences that makes Singapore so unique. The eOasia team has been travelling for the last three years in the area. Some of us already master the art of this Singapore language, and we would like to share with you what we have learnt from the locals so far. Singapore has four official languages : English, Tamil, Malay, and Chinese. Singlish language was born as an unique blend from these four languages, and also by the direct translation from Chinese to English. Although Singlish is not encouraged by the government, which favours English, Singlish is widely used in Singaporean communities and can be useful if you want to understand a bit more about this fascinating Singaporean culture. When you visit Singapore, going to food courts are a must as you will be able to taste some of the most amazing local food there. 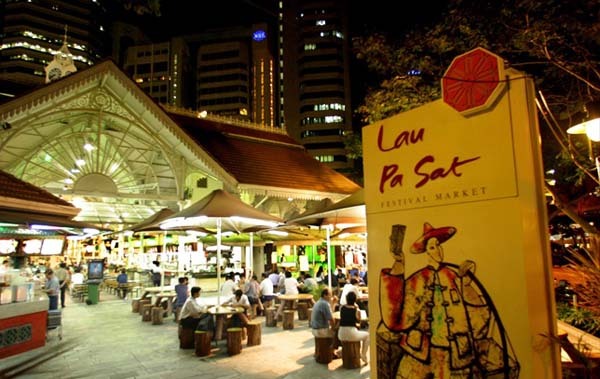 This is also a true local experience where locals use the Singapore language or Singlish a lot! “Makan” comes from the Malay language meaning “eat”. This Singlish term is officially part of their vocabulary, and you won’t be surprised to hear “let’s go makan” often! If you can not finish your food, ask them to take it away or “Ta pau”, a phrase which comes from the Cantonese meaning “to take away”. Just say these two magic words and the friendly people at the food court will pack the food for you. Lastly, you will get used to seeing Singaporeans “chop a table” while ordering by leaving a bag or a packet of tissue on their table; this is a common way to reserve a table. Kopi – kosong : Simple black coffee with nothing added in it. The same goes for the tea. 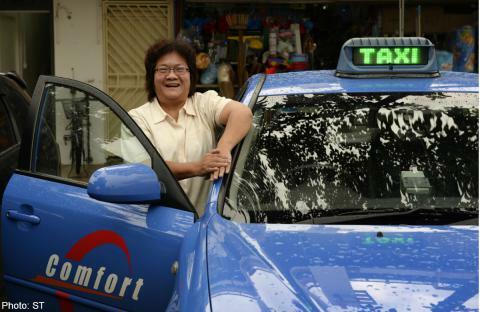 Taking taxi is easy, relatively cheap and convenient when you visit Singapore. This is also the place where you will have the best opportunities to improve your Singlish. Even though this is can be a taboo topic, it is also popular for taxi drivers to talk about “Gahmen”, shorten form of the english word “government”. Another useful word if you see the driver is taking his time, ask him to “Chiong” or “faster lah”, this is a simple way of saying “hurry up”. Another way of saying “hurry up” is “Chop chop”, commonly used in the Singapore language of every day. Don’t forget to bring in your Singlish dictionary for your taxi rides in Singapore! “Lah”: Normally used at the end of a sentence to express agreement or negation. This word is rather difficult to use correctly, but of course, all you need is to practice lah! 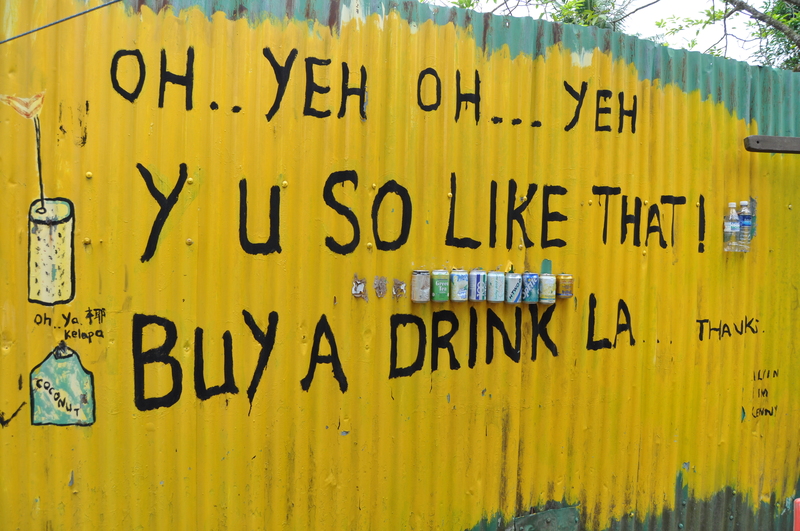 “Ok lah, Ok lo – Can lah” : This is the way to approve using the Singapore slang. “Last time”, Last time I was at school” which actually means “Before I was going to school”. “Oredy – already” – You will often hear “done oredy”, which means I’ve already done it. Or “Have you eaten oredy?”, which can also be a way of saying “how are you?”, being sometimes the first thing a Singaporean will say when meeting you, I concluded this only after living a few months in Singapore! “Thank you ahh”, Singaporeans also have a hobbit of adding “ahh” after thank you or some other words. Eg: “can do that ahh”, “like that ahh”. “Can mah? – Can me?” – In the Singapore language, locals like to use “Me or Mah” to punctuate their questions. The most common phrase you might hear during your visit of Singapore as a Caucasian is “Ang moh”. This is actually a Hokkien term which literally means “red hair” and this is a colloquial term used to describe Caucasians, so don’t be surprised! “Chio Bu” is the Hokkien equivalent of a pretty girl. “Kayu”: Malay for “wood”. Used to describe a person as useless. The most common use is during soccer matches, where fans would refer to bad referees as “referee kayu”. “Kantang”, which literally means “Potato” in Malay is a term to mock Singaporeans who became westernised, speaking more english than their mother tongue. The potato is seen as the western food, whereas the rice as the local food. “Auntie/Uncle” is a respectful way to speak to an older man / woman, widely used to talk to taxi drivers. “Aiyo” : used as a response to describe surprised moments, from things as trivial as a papercut to seriously bad news. Eg: “Aiyo! I just cut my finger!” You will also hear people complaining, using “Aiyo!”. “Kia su” literally means “scared of losing” in Hokkien. This phrase can be used for any situations involving the slightest form of competition. Eg: “She is so kiasu, she stayed overnight to work!” This phrase also influenced by the Chinese culture which is usually very hard working and highly competitive. “Walao!” it can seem a bit vulgar and this is very common, it is used to express exasperation, frustration, or irritation. 5C : Car, Cash, Credit Card, Condominium, Country Club membership. This is an expression to define material success of people living in Singapore. This is also referred as the Singaporean dream in the pursuit of material success. MC : MC which stands from Medical Certificate, is commonly used for Medical leaves. Usually, Singaporeans are allowed to 14 days of MC per year and are very hard workers! 4D is the national lottery in Singapore, locals love it and play regularly. Now, that you have this handy Singlish dictionary, make the most of your visit to Singapore by mingling with the locals. Ok lah? Also, don’t forget to check out all the best things to do in Singapore, handpicked by eOasia team. Find it very useful. Where can I buy this Singlish Dictionary for my foreign friends? Please advice. Thank you.